Lydia Davis, based in upstate New York, is a leading contemporary American author and translator of French. She has published four collections of short stories: Break It Down (1986); Almost No Memory (1997); Samuel Johnson Is Indignant (2001); and Varieties of Disturbance (2007), the last of which has been nominated for a National Book Award. 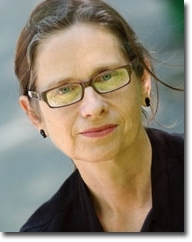 Lydia Davis has also translated into English works by such avant-garde novelists and memoirists as Maurice Blanchot, Pierre Jean Jouve, and Michel Leiris, and most recently Marcel Proust's Swann's Way (2002), which was awarded the French-American Foundation's 2003 Translation Prize. She is on the faculty of SUNY-Albany and is a Fellow of the New York State Writers Institute.